When a tooth has become cracked, weakened, or decayed to a point where a normal filling isn’t appropriate, dental crowns may be a good option. In fact, the procedure for crowns is even easier than it is for a filling, and takes only about an hour. A crown is an artificial shell made to cover your tooth. When a tooth has broken down, it will eventually fall apart due to cracks in the existing structure. We reduce the surface of the tooth and use a ‘’cap” to cover the tooth from all angles, holding the tooth together and strengthening it. The crown can be made of different materials, with porcelain being the most common. We let you choose which material you prefer, and you won’t be charged differently for your preference. To be fitted with a crown, two steps are required. 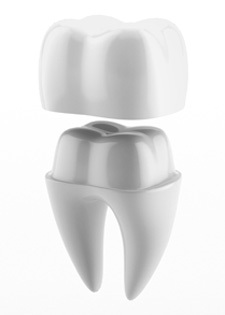 First, we’ll take an impression of your tooth that is to be covered by the crown. Then, we’ll prepare the crown. You’ll have time in between to sit up, have a chat, and make sure you’re feeling comfortable and relaxed. We’ll then give you a temporary crown to use until your permanent crown can be manufactured in the laboratory. Then, we cement your crown, leaving your teeth feeling even more stable and the new crown looking just like your other teeth. »» Click here for more information about Dental Crowns. Anchorage Dental Care can fit your teeth with crowns, leaving them feeling secure, comfortable, and fully functional. Call us to schedule (08) 9407 7888.